The towing eyelet should be used in an emergency (to get the vehicle out of a ditch or a snow bank, for example). When using the towing eyelets, always pull the lead or chain in a straight direction with respect to the eyelet. Never apply a sideways force. When towing with chain or lead, wrap the chain or lead with a soft cloth near the bumper to prevent damage to the bumper. Remove the towing eyelet and the wheel brace from the luggage compartment (page 7-3 ). Wrap a jack lever or similar tool with a soft cloth to prevent damage to a painted bumper, and open the cap located on the front bumper. Do not use excessive force as it may damage the cap or scratch the painted bumper surface. Remove the cap completely and store it so as not to lose it. 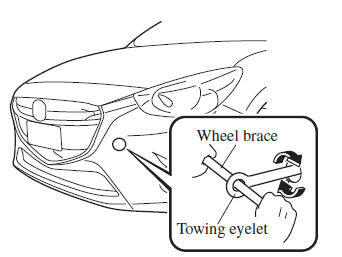 Securely install the towing eyelet using the wheel brace. Hook the towing rope to the towing eyelet. If the towing eyelet is not securely tightened, it may loosen or disengage from the bumper when towing the vehicle. Make sure that the towing eyelet is securely tightened to the bumper. 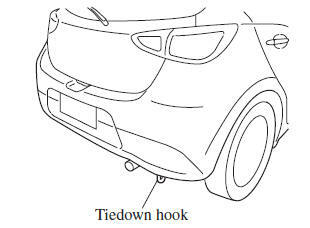 The hook positioned under the rear bumper on the driver's side is for tying down the vehicle during transport, and it cannot be used for towing other vehicles. It can be used as a towing hook only when the vehicle must be towed by another vehicle in an emergency case such as when the vehicle is stuck in snow, however, it may damage the bumper. When using the hook in such emergency cases, observe the following so as not to damage the tiedown hook or the vehicle body. The vehicle must be pulled straight to the rear so that no load is applied to the vehicle in the lateral direction. The bumper may be damaged if the tie down hook is used as a towing hook. When using a metal chain or wire lead, wrap a cloth around the attachment area. If the metal chain or wire lead contacts the bumper directly, the bumper could be scratched or damaged.